Our original story on downtown Raleigh's hidden tunnels was so popular, we decided to send our very own Gary Cooper down the river the file this video report. Every Raleigh urbanite has sipped brews at the Raleigh Beer Garden and sucked down cheesy pizza beneath the rainbow portobellos at Mellow Mushroom. If you were hanging out there last week, I snuck right under your feet, crawling beneath the forgotten tunnels and hidden cobblestone waterway that flows beneath West and Peace Streets in downtown Raleigh. You can find all kinds of mysterious things beneath the city streets. The downtown Raleigh "aqueduct" is antique, built many decades ago in an attempt to tame the Pigeon House Branch, a hidden river that flows through downtown. My Grandma remembers seeing the gravelly stone channel when watching baseball games at Devereux Meadow, a forgotten ball field whose shadowy outline can still just barely be seen in the overgrown parking lot beneath West Street, in the 1940s. Heather is an ABC11 Community Influencer, read more articles by her here! Many people have no idea that an entire river flows through downtown Raleigh, let alone that a historic canal carries that river beneath the land near West Street and Peace Street. In fact, the Pigeon House Branch stretches across many unexpected segments of downtown, concealed by old buildings and directed through drain pipes. Raleigh has a lot of plans for this natural feature, so I decided to follow the river -- under the tunnels, through the hand-masoned canals, and down towards Capital Boulevard -- and see what bits of history it might uncover. The Pigeon House Branch River makes its way through downtown Raleigh. If you follow the Pigeon House Branch to where it collides with Peace Street, you'll certainly spy the hidden entrance to the cobblestone waterway. The stone walls are at least 10-15 feet tall, so jumping or climbing down isn't advised. The secret pathway is antique and beautiful, like a castle moat oddly out-of-place in downtown Raleigh. It's a long stretch of smooth concrete floors and tall gravelly walls, crawling with green ivy and vines. I looked up and could barely see the tops of buildings, dilapidated rooftops of old factories or mills. Graffiti marks the entrance to this urban spelunking system. Some are just dashes of spray paint marring the antique walls, but a couple of artists seem to have put real effort into their work. At various places along the Pigeon House Branch's concrete tunnels and tributaries, you'll find spray-painted murals, like the vibrant mushrooms at Edna Metz Wells Park or the ethereal octopus you'll find swimming further downstream. The water flow is mild, and there's plenty of dry space to walk. The cobblestone channel hits Peace Street and flows into a sewer tunnel of brown water with floating garbage. Pipes veer off into Raleigh's under streets, carrying water from Pigeon House Branch into our sewers, which pour out of pipes to become creeks at downtown parks. In the other direction, the stone waterway leads to a long tunnel, which eventually becomes a small waterfall into the free-flowing Pigeon House Branch river. Parts of the Pigeon House Branch River are covered as it makes its way through Raleigh. Walking slowly and carefully, the underground tunnel takes about 15 minutes to walk through. With square ceilings and support pillars along the walls and floors, the rectangular tunnel feels almost like a mine. The thud-thump of passing cars on West Street adds to the creepy-factor. Spiders and cobwebs decorate the corners; in a few spots, the ceiling looks a little caved in. At one point we heard a train rumbling in the distance and had a moment of panic -- do the train tracks run overtop the tunnel? The ceiling gets lower and the water gets deeper. More graffiti, less sophisticated in this segment of the river, decorates the rough walls. The sound of a waterfall and a speck of daylight indicates the tunnel has reached the wide-open Pigeon House Branch. 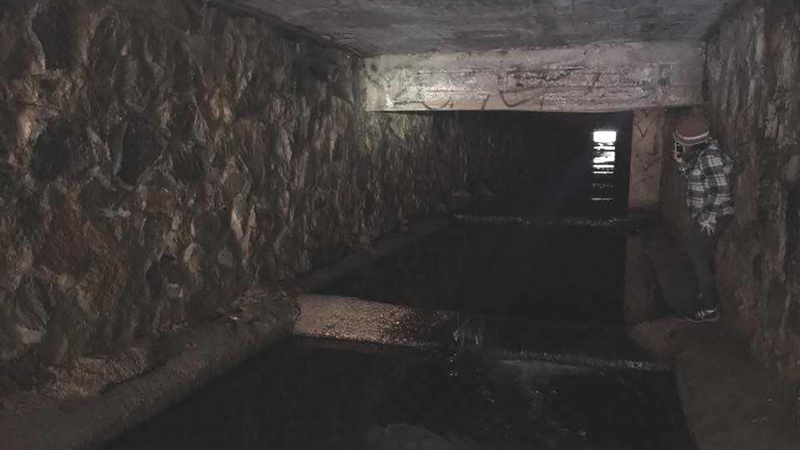 Exploring Raleigh's hidden underground aqueduct. Walking down West Street, we followed the Pigeon House Branch, trusting it to lead the way to more history and adventure. The river flows between old buildings, disappears beneath roads, peeks out again behind an old field behind a mill, then tumbles between the trees and underneath busy streets. My friend and I chased the water all the way down West Street, hitting a dead end at the traffic of Wade Avenue. We watched the natural river flow on out towards Cameron Village, where it is buried beneath progress, enclosed underground like the Village Subway. In fact, many segments of the river are buried now. Elsewhere, the Pigeon House Branch flows down Capital Boulevard. You can even catch a glimpse of the river from the Light & Time Tower. For years the City of Raleigh has aspired to provide a greenway running parallel to a water feature through downtown, and given the recent demolition nearby, the time may be at hand. By unearthing--or daylighting--the Pigeon House Branch, the city could raise this piece of lost history. In fact, Devereux Meadow tucked away just behind the concrete waterway and river, is slated to become part of a large downtown park and greenway system. While the glory days of baseball at Devereux Meadow have faded, and Pigeon House Branch has been buried beneath busy thoroughfares like Capital Boulevard and Cameron Village, the City of Raleigh's plans bring new promise to these bygones from the past. Imagine a river running through downtown, with a long greenway trail and wide-open natural spaces to go with it. A whole new generation may begin to enjoy these buried treasures, providing a rare happy ending for a piece of lost Raleigh history.